We are having fun learning all about frogs at our house! The kids have loved learning about the life cycle of a frog and have been pouring over the nonfiction books we checked out of the library. It has been so cool to see them grab a frog life cycle book to look up a tadpole or frog fact while they are pretend playing! There are tons of frog children’s books out there, but not all of them teach about tadpoles and the life cycle of a frog. If your kids or class in interested in understanding how the frogspawn turn into frogs and seeing awesome photos and illustrations then here are 5 books for you to check out! A Frog’s Life by Nancy Dickmann was a favorite for the clear, large photos and the simple text. This was one they reread many times. Starting Life: Frog by Claire Llewellyn has fun, different-sized tabbed pages so you can quickly turn to whichever stage of the frog life cycle you desire. This one contains a lot of interesting frog facts and information and has beautifully detailed illustrations. The Life Cycle of a Frog by Bobby Kalman is another one with great photography. The text is written in paragraph form and reads like an elementary school textbook. This would be a great choice for young students who are doing a science report or project. Scholastic Reader Level 1: From Tadpole to Frog by Kathleen Weidner Zoefeld is a great non-fiction early reader. It has simple texts and close up photographs and is another one conducive to repeated readings. My oldest reports this is also a favorite in her first grade classroom. The Life of a Frog by Claire Hibbert is well organized and easy to peruse. It packs a lot of info into each page and makes easy to read with graphics and text boxes. My kids must have looked at the wheel-like illustration of the life cycle of a frog at the beginning of this book dozens of times. I’d recommend all of these books about frogs for anyone interested in studying the life cycle of a frog. 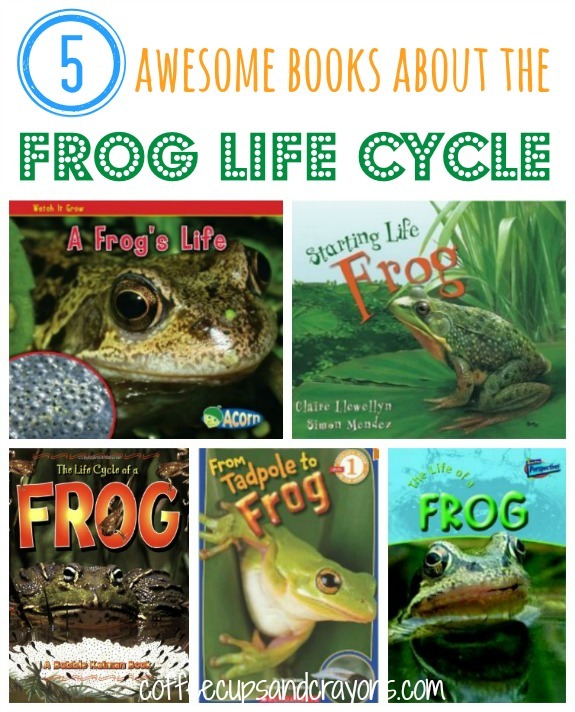 Are there any other frog life cycle books you would add to the list? Leave them in the comments for us to look for! If you are studying the life cycle of the frog then you may also be interested in our Frog Life Cycle Sensory Bin Frog Jump: Measurement and Gross Motor Activity and Art Activity for Children: Frog Foot Prints. They are great, hands on activities for kids!